Thousands of people marched through the streets of Madrid Saturday to protest against bullfighting and to draw specific attention to the cruelty of local becerrada festivals across Spain, in which calves so young they can sometimes barely stand are “fought” and killed by local amateur “matadors”. The annual ‘Misión Abolición protest held each September in the capital is organized by PACMA (Animalist Party Against Mistreatment of Animals) and supported by dozens of Spanish animal-rights groups. 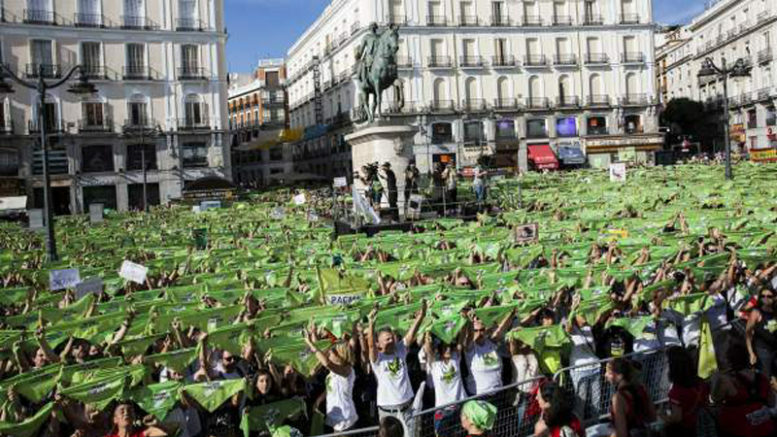 This year’s protest saw thousands of people under the banner of ‘STOP BECERRADAS’ march along a circular route from the Puerta del Sol plaza, past Spain’s Congress and through downtown streets to finish back at the same plaza with a rally calling for the abolition of the “torture” of animals in bullrings throughout Spain. Sporting green triangular neckerchiefs bearing the Misión Abolición slogan, the anti-bullfighting protesters listened to PACMA President Silvia Barquero condemn the cruelty of the becerradas, in which calves deemed too young to be included in professional bullfights are taunted and then killed by local people in traditional festivals in small towns and villages. “We cannot leave the protection of animals up to the mayors of small towns”, Barquero said. “Tradition is not a justification for barbarism. In Spain it was once also customary to burn witches and execute people (by strangulation) with the garrote vil”.